The most common concern among my clients is love, but the second most common concern is work and career. Clients are either looking for work, wanting to change careers, wishing to start a business, or have concerns about various situations in their present job. I use a thimble to represent work and career issues in both my sets. I used to sew some of my own clothes and some for my family as well. Back then you could make clothing for less than it cost to buy new, good quality clothing. Nowadays clothing is less expensive and fabrics for sewing are more expensive so I rarely take my sewing machine down unless I want to make something simple like a bag, or to repair a piece of clothing. I liked to sew, but it making clothing is not easy – it is hard work. I enjoyed sewing, but it was work nonetheless. That is how I chose a thimble to represent work. 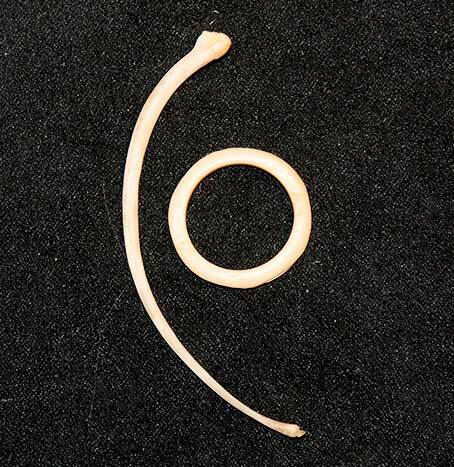 It was something small enough to fit easily in a bone set, and it had personal meaning for me. 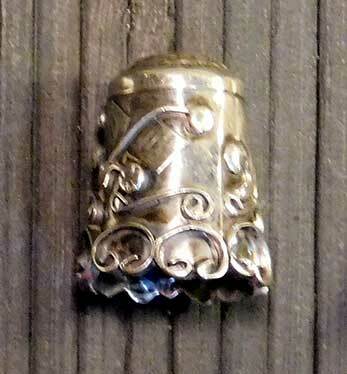 When doing a reading I always look to see where the thimble is and what pieces are nearby. If the piece is far from the piece that represents the client with nothing really nearby, it can indicate that the person is probably not spending a lot of time thinking about their job. They may work that job because they need to pay the bills and have no plans to make their current job their career. It could also indicate that things are going well at work so they have no concerns in that area. Generally, these folks don’t ask about their career, of they ask after they have asked about everything else as an afterthought. When clients do have work concerns, I usually find that there is a lot going on around the thimble. In some cases, clients have concerns about their co-workers or specific situations involving one or more co-workers. In those cases, I sometimes ask them to describe the co-worker they are having issues with and designate an appropriate piece in my set to represent that person. You could also add a piece or pieces to represent the various parties involved in a work situation. 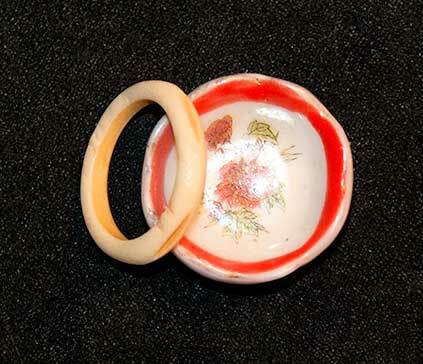 Thimbles come in various sizes and can range in price from less than a dollar to over a hundred dollars for a fine antique in a precious metal. I bought a decorated silver thimble for my main set, but used a regular stainless steel thimble for my travel set for years. I tried replacing it with a ceramic thimble with an image that I liked, but it was much bigger than the original so I ended up putting it into the overflow bin. I finally bought an inexpensive silver thimble for my travel set as well. 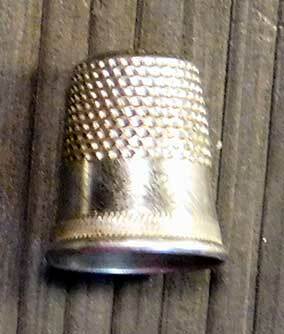 You can get a simple metal thimble anywhere that you can buy needles and thread. 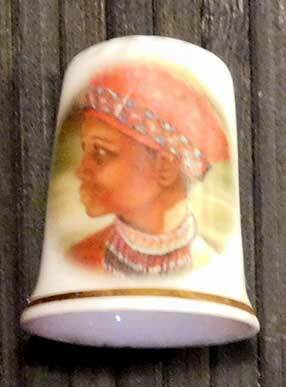 Antique shops sometimes have fancier thimbles as some people collect them. Ebay is where I got my fancy thimbles and they have a wide array of styles, sizes, and prices. You could also use something else entirely to represent work and career – anything small that represents work for you will do. I think that if you read for others frequently you may want to consider designating a piece to represent work or career since you will probably find yourself reading for folks with concerns in this area. I first saw this cloth somewhere on Facebook – sadly I don’t remember just where. Always on the lookout for bone reading accoutrements, I decided to purchase one. It is cotton, and it measures 22″ X 22″. The pattern is painted in a metallic copper-colored paint. It is very pleasing to the eye, and while the size would be cramped for a large set, it is perfect for those times when you just want to throw a handful of bones for a quick answer. It is divided into seven sections, and each section has a symbol in it. There is a small hand-made booklet that comes with the cloth that gives several suggested meanings for each symbol/section. You could choose one or more of the suggested meanings, or just ignore them and assign your own meanings. It was beautifully packaged and had some extra goodies included in the package – a postcard, and a fish fortune-teller, as well as the artist’s business card. The cloth also comes with three pieces – a key, a piece of pyrite and a dark stone. Suggested meanings are given, but the booklet also says you can use your own pieces. If you have a bone set you could add them to it, or they can be used on their own. Professor Pam’s Beetle Bone Casting Cloth with booklet and pieces. This is an attractive cloth which is also practical. It is light weight, and can be folded small so as not to take up much room. It is also a beautiful piece of art. If you have been looking for a new reading cloth, you might want to check it out. 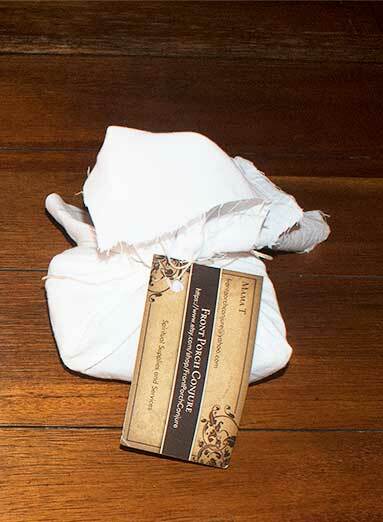 Professor Pam’s Beetle Bone Casting Cloth at Etsy – look under cloth and fiber. Professor Pam’s Beetle Bone Casting Cloth looks even better when turned 90 degrees. the phase of the moon when it is in conjunction with the sun and invisible from earth, or shortly thereafter when it appears as a slender crescent. I have a piece in my set to represent the New Moon. I use it to represent things that are happening that are not yet visible. When we look at the night sky during the new moon, we may not see the moon at all. But we know that the moon is still there. Likewise, when this piece is active in a reading, things are happening around the situation it is addressing, we just can’t see them yet. And just like the moon will become visible again, whatever is happening will soon become apparent. This piece can be reassuring if things feel stagnant, or if it feels like no progress is being made on an issue. Things are happening behind the scenes, you just don’t see them yet. It can also be a warning that something you thought had been resolved is still percolating under the surface. It will eventually boil over and into view, for good or bad. 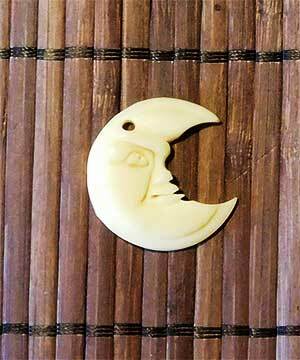 A crescent moon charm, a small black disk, or anything that suggests the new moon to you can be used for this piece.The new moon and the full moon pieces have both served me well, showing me and my client likely movement in the situations they address. Of course, there is so much information about the moon – scientific, mythical, and spiritual, that you may come up with meanings that do not resemble mine in any way. 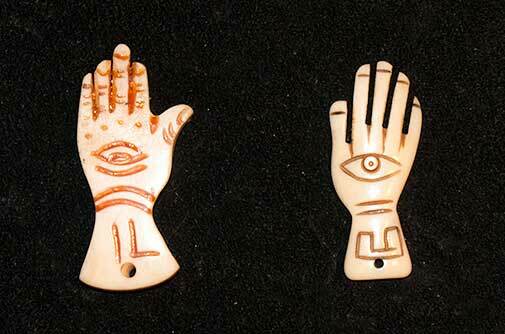 That is the beauty of bone reading – meanings come from our heads, hearts, souls, and spirits. I am always on the look out for bone reading sets to add to my small collection. I recently came across the Front Porch Conjure Bone Reading Set on Etsy. The set came bundled in a piece of white cotton. I love interesting packaging and I thought this was a nice touch. There are 26 pieces in the set. I would imagine that the actual pieces might vary over time due to availability. It also has a bag, instructions, and a small bottle of Florida water. There are four pages of instructions included with the set. They provide a suggested meaning for each piece, as well as a suggested technique for answering yes/no questions. This is a very nice set with a good set of instructions. I received it quickly and it was well packaged to prevent shipping damage, and to please the eye. It would make a great starter set to which you could add your own pieces, or it could be used just as it is. I bought this set from Front Porch Conjure on Etsy. You can also contact them on Facebook. Left to right – Cougar, Porcupine, Python, Snake (species unknown). One of the ribs in my bone set broke this week. It didn’t break during a throw. I found it broken in the basket. I figured that was a sign that it was time to write about ribs. 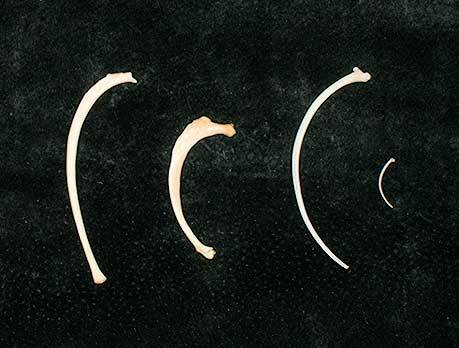 I have two ribs in my bone set – a python rib, and a possum rib that had been broken and healed before the animal died. I assign them very different meanings. In my set the python rib usually represents constriction. It tends to wrap itself around other pieces in such a way as to visually appear as an impediment or block. The possum rib represents something painful from the past that you have recovered from, but it still left a scar. The bone is thicker at the break point so it could be interpreted as being stronger, but it is also probably less flexible there. Ribs can also be interpreted as support. In the body they support and protect the organs they surround – particularly the heart. You could certainly work that information into your interpretation of this piece. If it looked like it was supporting something I would interpret it as support as well, but I find that the rib usually wraps itself around other pieces in a way that looks constrictive to me. Of course ribs can also be interpreted as having the characteristics of the animal they came from. Many commercial sets come with snake ribs and there is loads of information, both scientific and mythical about snakes in general, and about snakes by species. For example you might interpret the rib of a venomous snake differently than the rib of a snake that kills it’s prey by constriction. Although they look delicate, ribs are usually quite sturdy. They don’t break that easily and the rib that recently broke is only my second rib. I suspect that the ribs in my set that have broken got caught in a shell and then bumped by another piece. They might have lasted longer in a set with fewer large pieces, or no shells for them to fall part way into. Ribs are available in a wide variety of sizes so you should have no trouble finding one that fits well with your other pieces. 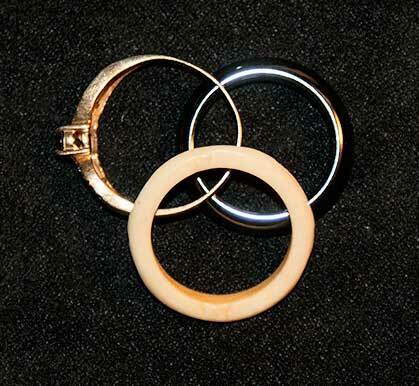 They are truly versatile pieces that lend themselves to a wide variety of meanings. If your set did not come with a rib, you may want to consider adding one. 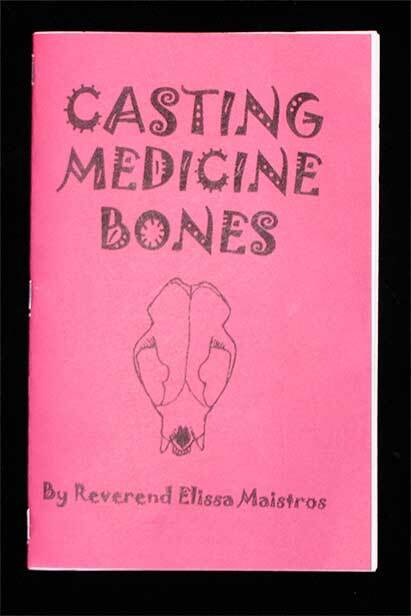 This small, 20 page chapbook-style booklet by New Orleans artist Skully Elly (Reverend Elissa Maistros), describes a simple bone reading method using 9 pieces. 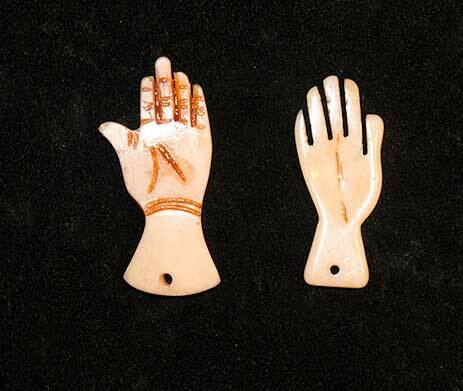 It used to be available with a set of bones, that you can see here, but now only the booklet is available. I happen to have a few extra bones and things laying around so I decided to put a set together for myself based on the book. While the number of pieces is small, the system still manages to give quite a bit of information by using the position and orientation of each piece. The booklet provides the meanings with illustrations. Because there are so few pieces each piece carries several possible interpretations depending on how it falls. This requires a bit of memory work up front, but it is not too onerous – nothing like memorizing the meanings for tarot cards. 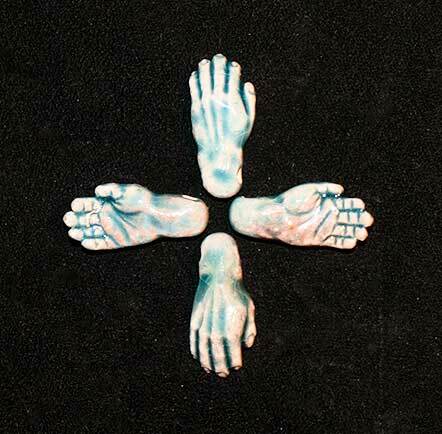 Medicine Bones Cast on mat. The reading surface is also used to aid in interpreting the throw. You can memorize the layout from the illustration in the booklet. It is simple and consists of three sections. The book also suggests drawing it on a piece of paper or cloth, and carrying it with your bone set for use. I tried to approximate the look of this set as closely as possible. I had most of the pieces on hand and ended up buying a skull, and two stones. I think it is an attractive bone set as laid out in the booklet. However, you could easily substitute pieces with what you had on hand. The size of some pieces relative to each other and some of the the shapes are important, but you could use something like a twig to replace a bone, or use something else instead of stones, etc. It has a small number of pieces, but it is capable of providing a lot of information due to the way the pieces are interpreted. The booklet is a quick, easy read with lots of illustrations, and some excellent divination tips. I don’t think it would be too difficult to learn this style of bone reading. If you are looking for a different method of bone reading you might want to give this a try. You can order the booklet from Louie’s Juke Joint. Medicine Bones, booklet, and bag.